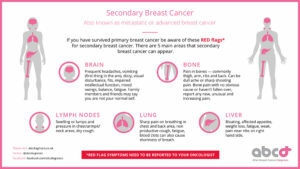 In 2015 I produced an infographic which I felt was hugely needed for patients understanding the “red flag symptoms” of secondary/metastatic/advanced breast cancer. The Policy and Campaigns Manager at Breast Cancer Care had found my #SBCinfographic and I was advised that hospitals such as Ipswich hospital are actually referring patients to it. They are now looking to refer to this and to my website in their best practice report. They have written a case study for Ipswich hospital which includes my #SBCinfographic. If this is then published they may consider including the guide as a one pager and info of how professionals can download this. I am hoping that ALL primary patients, after initial breast surgery and chemotherapy has ended or at their first year review, that they will get a copy of this to make them aware of signs and symptoms of secondary breast cancer. So watch out for my #SBCinfographic and I would love to know if you have found it useful. I know it was hugely needed and many others advised the same, which is why it was made into an easy format for people to view instead of reading a lengthy document. Please share this with anyone who has had breast cancer. You may just help them identify problems quicker and have more of an understanding of secondary breast cancer. A huge thank you to my Secondary Breast Cancer Nurse and Clinical Nurse Specialist Claire Gaskell and my Oncologist Dr Greg Wilson who approved the information was relevant.